Have you noticed a mushrooming of Family Mart, the famous Japanese convenience store brand, stores across the streets of Kuala Lumpur recently? Perhaps, like me, you did. If so, have you ever wondered how this Japanese convenience-store chain grew so rapidly in the Klang Valley? Here, I have the story and it is related to QL Resources Bhd. If you are not a local stock investor, perhaps, you may not have heard of this company or be aware of its existence. But, to a trained investor, QL Resources Bhd had delivered sets of stellar financial results and compounded investors’ wealth since its listing in the year 2000. Today, it is among the largest agro-food corporations in Asia with a market capitalization of RM 9.73 billion. 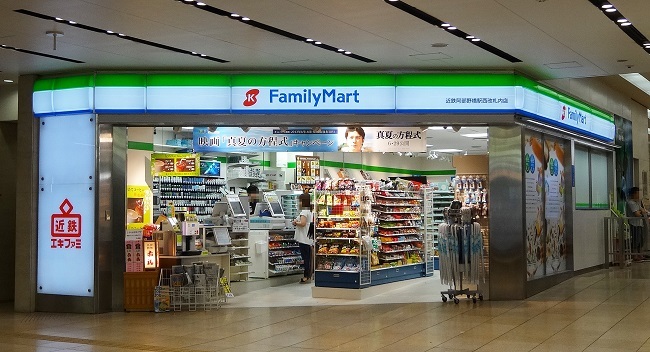 In this article, I’ll cover QL Resources Bhd’s notable achievements, discuss in length on its venture into Family Mart chain stores and provide an update on its plans for sustainable growth in the future. Thus, here are 8 key things that you need to know about QL Resources Bhd before you invest. It is presently the largest fishmeal manufacturer in Malaysia and also the largest surimi producer in Southeast Asia. QL Resources Bhd has the capacity to produce up to 35,000 MT of surimi a year, 40,000 MT of surimi-based products a year, and 35,000 MT of fishmeal products a year. This division has generated RM 905.4 million in sales and RM 124.2 million in profits before tax (PBT) and thus, is the main source of income to QL Resources Bhd in 2018. It is one of the largest animal feed raw materials and poultry farming operators in Malaysia. Today, QL Resources Bhd is able to produce as much as 5.5 million eggs per day, 40 million Day Old Chicks (DOC), 20 million broilers, and 1 million MT of animal raw feeds per annum. This division has generated RM 1.97 billion in revenue and RM 103.2 million in PBT and thus, is the second largest income contributor to QL Resources Bhd in 2018. It has 1,200 hectares of mature palm oil estates in Sabah and another 9,000 hectares of mature palm oil estates in East Kalimantan, located in Indonesia. It has three palm oil mills with a total milling capacity of 1.1 million MT per year. 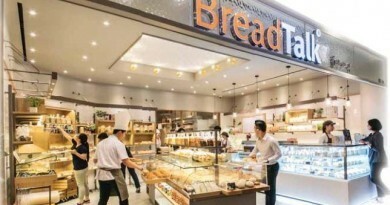 This division has generated RM 387.3 million in sales and RM 27.9 million in PBT and thus, is the smallest income contributor to QL Resources Bhd in 2018. QL Resources Bhd has achieved consistent growth in both sales and earnings for the last 10 years. Revenues have increased from RM 1.40 billion in 2009 to RM 3.26 billion in 2018. This, in turn, had raised shareholders’ earnings from RM 89.3 million in 2009 to RM 206.2 million in 2018. As at 31 March 2018, QL Resources Bhd’s non-current liabilities amounted to RM 646.3 million. Thus, its debt-to-equity ratio works out to be 36.05%. Also, it was reported to have RM 282.3 million in cash reserves and a current ratio of 1.58. Thus, it has maintained a healthy balance sheet which is vital to finance its plans for growth into the future. QL Resources Bhd is working on an extension project where it plans to produce surimi-based products & import bulk-packed products to be repacked and for further distribution in Indonesia. It would incur a cost of RM 5 million and the operations for the project would start in 2019. In addition, a new fishmeal line which includes an extension of factory floor space at a cost of RM 10 million is in progress. QL Resources Bhd is building a new integrated layer farm where the production capacity would be enlarged by 30% to 650,000 eggs a day. This is an extension project and thus, increasing the investment cost that was allocated from RM 50 million to RM 70 million. QL Resources Bhd has 6,000 hectares of unutilized plantation land in East Kalimantan. 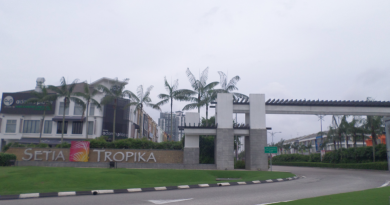 These estates provide an avenue for growth once they are planted in the future. On 11 April 2016, QL Resources Bhd had signed an area franchise agreement with FamilyMart Co. Ltd where QL Resources Bhd’s 100%-owned subsidiary, Maxincome Resources Sdn Bhd is granted the exclusive master franchisee to operate Family Mart convenience stores in Malaysia for 20 years. As of 6 July 2018, QL Resources Bhd has 50 Family Mart stores in Malaysia. It intends to hit 89 stores by 31 March 2019 and hit 300 stores by the year 2022. As I write, QL Resources Bhd is trading at RM 6.00 a share. 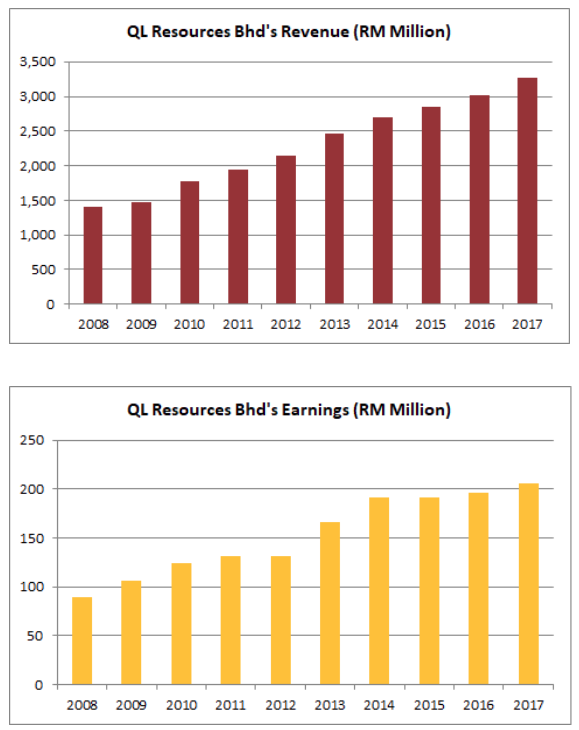 In 2018, QL Resources Bhd had reported earnings per share (EPS) of 13.0 sen. Thus, its current P/E Ratio is 46.15, the highest in 10 years. From 2009 to 2018, QL Resources Bhd had achieved CAGR of 9.74% in shareholders’ earnings. 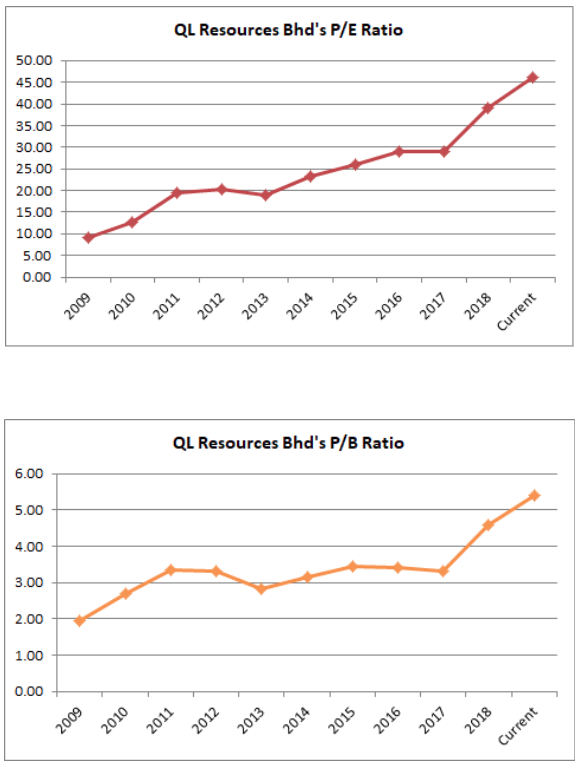 Hence, QL Resources Bhd’s PEG Ratio is 4.74. In 2018, QL Resources Bhd has net assets a share of RM 1.11. Thus, its current P/B Ratio is 5.41, the highest in 10 years. In 2018, QL Resources Bhd has declared RM 0.0875 in dividends per share (DPS). Thus, its current dividend yield works out to be 1.46%. Dr. Chia Song Kun is the main shareholder of QL Resources Bhd through his interest in CBG (L) Pte Ltd. He is now appointed as the Executive Chairman of QL Resources Bhd. His brothers-in-law, Chia Seong Pow & Chia Seong Fatt are key shareholders of QL Resources Bhd via their interests in Farsathy Holdings Sdn Bhd. They are appointed as Executive Directors of the company.